Prompt laboratory diagnosis of Herpes simplex virus (HSV) infection facilitates patient management and possible initiation of antiviral therapy. In our laboratory, which receives various specimen types for detection of HSV, we use enzyme immunoassay (EIA) for rapid detection and culture of this virus. The culture of HSV has traditionally been accepted as the diagnostic 'gold standard'. In this study, we compared the use of real time PCR (LightCycler) for amplification, detection and subtyping of specific DNA with our in-house developed rapid and culture tests for HSV. The LightCycler PCR (LC-PCR) detected and subtyped HSV in 99% (66/67) of HSV positive specimens, compared to 81% (54/67) by rapid antigen EIA or 57% (36/63) by culture. A specimen was considered positive when two or more tests yielded HSV identifications or was culture positive. Discordant results were confirmed with an in-house developed PCR-ELISA or DNA sequence analysis. The typing results obtained with the LC-PCR and by culture amplified test were completely concordant. This study showed that the LC-PCR provided a highly sensitive test for simultaneous detection and subtyping of HSV in a single reaction tube. In addition to increased sensitivity, the LightCycler PCR provided reduced turn-around-times (2 hours) when compared to enzyme immunoassay (4 hours) or culture (4 days). Herpes simplex virus (HSV) infection in adults is usually benign (e.g. oral cold sores) . When it occurs in critical anatomical sites, for example ocular or central nervous system, or acquired by the neonate during parturition, the sequelae may lead to serious complications [16, 17]. There are two subtypes of herpes simplex virus – HSV 1 and HSV 2, both of which a patient may be concurrently infected with . One central feature of HSV infection is reactivation from the sensory nervous system of latently infected humans, although the triggers for this are not well defined. Infection with HSV is thus lifelong with unpredictable reactivations in which lesions may not always be manifested . Laboratory diagnosis of HSV infection has relied on virus isolation in cell cultures and rapid tests viz. enzyme immunoassays (EIA) , immunofluorescence  or nucleic acid amplification by PCR . In our laboratory, which provides a diagnostic service for hospital inpatients and outpatients as well as private physicians, genital, ocular and cutaneous specimens are regularly submitted for routine HSV detection. These are tested by rapid EIA and inoculated into cell culture with subsequent detection and subtyping of viral isolates by specific monoclonal antibodies. Recently the availability of real time quantitative PCR with the LightCycler (Roche Diagnostics) has enabled a significant improvement in rapid detection (<1 hr) of HSV nucleic acid sequences compared to conventional PCR and gel electrophoresis [2, 3]. The LightCycler enables rapid PCR amplification of target nucleic acid due to the high temperature transition rates (20°C/sec) facilitated by specially designed glass capillary reaction vessels and temperature control via heated or ambient air. Real-time monitoring of amplified DNA product formation and characterisation is also possible using a pair of fluorescence-labelled hybridisation probes. Hybridisation of the probes in close proximity (< 5 nucleotides separation) results in fluorescence resonance energy transfer (FRET) between the flourophores. The donor fluorophore (fluorescein) is excited by light emitted from the LightCycler instrument and part of the excitation energy it releases is transferred to the accepter flourophore (LC-Red 640 or LC-Red 705). The resulting energy emitted by the acceptor fluorophore is measured by the LightCycler and is proportional to the amount of specific PCR product in the reaction mix. Using primers and hybridisation probes designed to enable optimal separation of viral DNA subtype melting curves, we compared detection and subtyping of HSV by rapid EIA and culture with the LightCycler PCR. Figure 1 shows typical LightCycler amplification curves with HSV DNA extracted from three specimens and two concentrations of HSV-1 and HSV-2 positive controls with the corresponding melting curves differentiating HSV-1 and HSV-2 subtypes (Fig. 2). Limiting dilutions of HSV-1 and HSV-2 stock cultures were prepared in 105 A549 epithelial cells (or in viral transport medium, VTM) followed by DNA extraction and subsequently tested in the LightCycler. There was no difference in detection sensitivity of HSV-1 or 2 whether diluted in A549 cells or in VTM. The endpoint dilution obtained with the LC-PCR was 10-0.5/ml for HSV-1 and 10-1.2/ml for HSV-2. The corresponding endpoint dilutions obtained with HSV PCR-ELISA were 101.6/ml for HSV-1 and 100.2/ml for HSV-2. The limit of detection for both HSV-1 and 2 using HSV plasmid DNA was calculated to be 20 copies/reaction (equivalent to 4 copies/μl). This is similar to the detection sensitivity of 20 copies of HSV DNA  and ≥10 copies of Parvovirus B19 DNA per reaction (Roche Molecular Diagnostics). The HSV-1 and 2 plasmid DNA sequences aligned perfectly with the corresponding sequences of HSV-1 and 2 obtained from GenBank. The specificity of the LC-PCR was confirmed by testing DNA extracted from Varicella zoster virus (clinical isolate), cytomegalovirus (AD 169 strain), cytomegalovirus (clinical isolate) and B95a (Epstein-Barr virus – transformed lymphoblastoid line) . No amplified DNA was detected from any of these samples. When double blind coded samples were prepared and tested under standard operating procedures for nucleic acid extractions and amplifications in our laboratory, the results obtained were concordant with the sample codes viz. the appropriate samples were identified as two positive for HSV-1 and three HSV-2, with the remaining 19 samples negative for HSV DNA in the LC-PCR. These concordant results suggest the absence of cross-contamination during DNA extractions. There were 75 (29%) specimens positive for HSV by LC-PCR (50 were HSV-1 and 25 HSV-2), 55 (21%) were positive by rapid antigen EIA and 36 (14%) positive by culture amplified test (26 were HSV-1, 8 were HSV-2 and 2 were untypeable). A culture result was not obtained in 21 specimens due to bacterial/fungal contamination. There were insufficient materials from the latter specimens for filtration and repeat culture. If these specimens are excluded, the detection rate by culture amplified test is 15% (36/241). Specimens which were LC-PCR positive but negative by rapid antigen EIA and culture were tested by PCR-ELISA. Table 1 compares the LC-PCR with rapid antigen EIA for detection of HSV. Of the 55 specimens which were positive in the rapid antigen EIA 53 were LC-PCR positive. Of the two specimens negative by LC-PCR (but rapid antigen EIA positive) one was culture positive and the remaining specimen yielded bacterial contamination in the culture amplified test. There were 22 (75–53) specimens which were LC-PCR positive but negative by rapid antigen. Of these 22 (12 HSV-1 & 10 HSV-2) specimens, 12 were positive by PCR-ELISA and an additional one was culture positive. There were 7 specimens which were LC-PCR positive only. Analysis of the LC-PCR amplified DNA sequences from the latter specimens confirmed that HSV DNA had been amplified, although this may not be regarded as an independent detection test. Comparison of LightCycler PCR (LC-PCR) with rapid antigen EIA and culture amplified detection of Herpes simplex virus in 262 specimens. Notesα 4/4 culture contaminated. β 12/19 PCR-ELISA positive and 7/19 negative. γ 2/2 PCR-ELISA negative and culture contaminated. δ 1/1 PCR-ELISA negative and culture contaminated. φ14/185 culture contaminated. There were 36 specimens positive in the culture amplified test (Table 1). All but one of these specimens were also positive in the LC-PCR test. The specimen which was negative by LC-PCR but culture amplified positive was also positive in the rapid antigen EIA. Overall there were 67 specimens positive by two or more tests viz. LC-PCR, rapid antigen EIA, PCR-ELISA or culture (see Table 1). If a true positive is defined as a specimen positive in at least two tests or culture positive, then the sensitivity, specificity, positive predictive value and negative predictive value for LC-PCR are 99% (66/67), 95% (171/180), 88% (66/75) and 99% (171/172), for rapid antigen EIA are 81% (54/67), 100% (178/178), 100% (54/54), 93% (178/191) and for culture are 57% (36/63), 100% (178/178), 100% (36/36), 87% (178/205). Specimens which yielded contamination in the culture amplified test were excluded in this analysis, except those which were positive by two or more tests. The difference in sensitivities between the LC-PCR and rapid antigen EIA (χ2 12.12, degrees of freedom 1 and p = 0.0005), LC-PCR and culture (χ2 39.54, degrees of freedom 1 and p < 0.0001) or rapid antigen EIA and culture (χ2 15.27, degrees of freedom 1 and p < 0.0001) were statistically significant. Multinomial logistic regression was used to compare the sensitivities between the tests. The comparison of sensitivities was calculated using the weighted least squares method of Grizzle et al. .
All specimens positive in the LC-PCR were subtyped by melting curve analysis with 50 identified as HSV-1 and 25 as HSV-2 (Table 1). There were 36 culture positive specimens subtyped, with 26 HSV-1, 8 HSV-2 and 2 untypeable (see Table 1). The latter two specimens yielded equivocal subtype results even though the isolates were identified as HSV in the rapid antigen EIA. However, there was complete concordance between LC-PCR and culture amplified test with subtype identifications. The two specimens which yielded inconclusive typing results in the culture amplified test were both identified as HSV-1 by LC-PCR while the one culture positive but LC-PCR negative specimen was HSV-2. The availability of antiviral therapy [13, 18] and the requirement for patient management has increased demand for rapid laboratory diagnosis of HSV infection. Detection of virus by enzyme immunoassay or immunofluorescence staining of infected cells have offered rapid diagnosis, with virus isolation in cell cultures used as the reference test ("gold standard") or subtyping of HSV . Detection of HSV DNA by PCR has primarily been used to test cerebrospinal fluid (CSF) samples in patients with suspected herpes encephalitis where the low levels of HSV in CSF samples required the use of the most sensitive test possible . The use of real time amplification and detection of nucleic acids in sealed capillary tubes in the LC-PCR has significantly increased test efficiency in three ways. Firstly, amplification and detection of HSV DNA, followed by subtyping, can be completed within one hour post extraction of nucleic acids from specimens compared to >6 hrs with conventional PCR amplification followed by amplicon detection in gel electrophoresis or ELISA . Secondly, the use of two closely-spaced (separated by 2 nucleotides) fluorescence-labelled hybridisation probes (28 and 21 mers) adds to specificity confirmation of amplified sequences. Thirdly, being a sealed system the attendant potential problem of contamination with amplified nucleic acid sequences is minimized. In this study, the sensitivity of LC-PCR (99%) exceeded that of rapid antigen EIA (81%) and culture (57%) in which a true positive specimen was defined as having two or more positive test identifications. The LC-PCR specificity and positive predictive value would be higher (100% in both determinations) if the nine LC-PCR positive specimens that were negative by other tests were considered as true positives. We believe that it is likely that these nine LC-PCR results are true positive for the following reasons. DNA sequence analysis of the LC-PCR products confirmed their identities as being concordant with HSV DNA sequences obtained from GenBank (data not shown), thus excluding false positives due to other agents. The laboratory practice of strict separation of preparation, set-up and analysis areas for PCR procedures as well as the concordant results obtained with the double blind coded samples support the argument that it is unlikely that there was contaminating HSV DNA. It may be expected that these nine LC-PCR positive specimens would be positive in the PCR-ELISA. The latter amplified a different region (from the LC-PCR) of the HSV DNA polymerase gene. The PCR-ELISA was shown to have a detection sensitivity of 24 copies/μl compared to 4 copies/μl with LC-PCR. Finally specimens which were HSV DNA positive but virus culture negative have also been reported by others [1, 3]. If these nine LC-PCR specimens were considered true positives, then the revised sensitivity, specificity, positive predictive and negative predictive values for the LC-PCR are 99% (73/74), 100% (171/171), 100% (73/73) and 99% (171/172). The typing results obtained with the LC-PCR and by culture amplified test were completely concordant. The LC-PCR provides a highly sensitive and rapid test for detection of HSV with immediate differentiation between types 1 and 2 in a single reaction tube. Since these results can be achieved at reduced costs and in a shorter period when compared to antigen detection or culture, the LC-PCR or similar real time nucleic acid amplification tests are likely to become the test of choice for diagnostic virology. Specimens submitted in virus transport medium (VTM) for routine screening of HSV were randomly selected for inclusion in this study on a prospective basis. There were 262 specimens tested by LC-PCR, rapid antigen EIA and inoculation in A549 cell cultures. This included 106 cutaneous, 20 ocular, 106 anogenital, 1 respiratory and 29 site unspecified specimens. Individual aliquots of each specimen were prepared for HSV DNA amplification by the LightCycler (LC-PCR), rapid enzyme immunoassay of HSV antigen and culture amplification followed by subtyping with enyzme immunoassay . DNA was extracted from 200 μl of each specimen using QIAamp DNA mini kit according to the manufacturer's method (QIAGEN). Extracted DNA was resuspended in 200 μl of elution buffer and 5 μl was used in the LC-PCR or PCR-ELISA test. The SC16 strain of HSV-1 and MS strain of HSV-2 were used as positive controls and titration determinations. SC16 was a gift from Dr A. Simmons . The MS strain of HSV-2 was obtained from the ATCC (VR 540). These viruses were grown and passaged according to standard virological methods . Specimens submitted for routine HSV screening were tested in the rapid antigen EIA and inoculated in A549 cell cultures. Inoculated cell cultures were subsequently tested for HSV by enzyme immunoassay after four days post inoculation. This in-house developed test is called the culture amplified HSV test . HSV subtype was differentiated in the culture amplified test (but not in the rapid antigen EIA) by comparing binding ratios of viral isolates with specific monoclonal antibodies to HSV-1 or 2. The previously described  forward primer, HSV pol F (5' GCTCGAGTGCGAAAAAACGTTC 3') and a new reverse primer, HSV pol A (5' TGCGGTTGATAAACGCGCAGT 3')  were used to amplify a 140 bp product. A pair of newly designed fluorescence labelled probes, HSV-2 FLU (5' GCGCACCAGATCCACGCCCTTGATGAGC-FLUOR) and HSV-2 LCR (5' LC-Red 640-CTTGCCCCCGCAGATGACGCC-phos) were used for real-time detection and melting temperature differentiation of HSV-1 and 2. The LC-PCR master mix contained the following: 1× FastStart Taq DNA polymerase reaction buffer (Roche Molecular Diagnostics) which included a dNTP mix (containing dUTP instead of dTTP), 3 mM MgCl2, 0.5 μM of each primer, 0.2 μM HSV-2 FLU and 0.4 μM HSV-2 LCR. Cycling conditions were as follows: initial denaturation/FastStart Taq DNA polymerase activation at 95°C/10 min, 45 cycles of denaturation at 95°C/5 sec, annealing at 58°C/10 sec (with fluorescence acquisition at the end of each annealing stage) and extension at 72°C/12 sec. After amplification was complete, melting curve analysis was performed as follows: denaturation at 95°C/20 sec, annealing at 45°C/30 sec followed by a gradual increase in temperature (transition rate of 0.1°C/sec) to 85°C with continuous fluorescence acquisition. 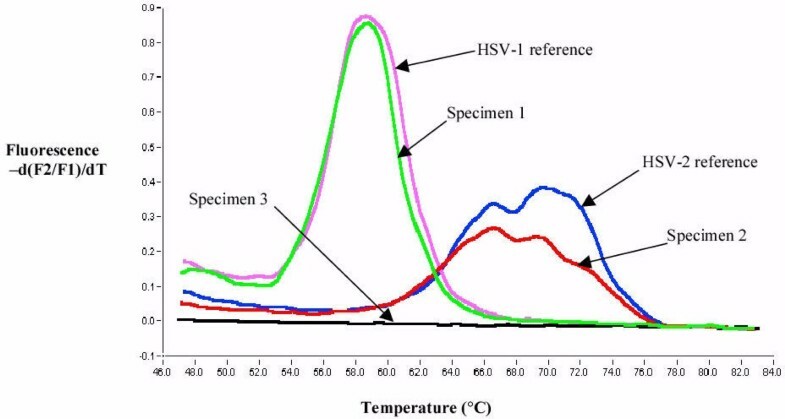 The melting temperature of the HSV-2 LCR probe can be used to determine whether the amplified DNA sequence is related to HSV-1 or 2. The probe melting temperature is that at which 50% has dissociated from the template strand. If the first negative derivative (-dF/dT) of the melting curve is plotted, the melting temperature is calculated as the turning point of that curve. The HSV-2 LCR probe was designed to bind to a region where there was a 2 base pair difference with HSV-1. The probe sequence is exactly complementary to HSV-2 DNA. The probe has a melting peak at ca. 58°C when hybridised to HSV-1 DNA and a peak at ca. 71°C with a shoulder at ca. 66°C when hybridised to HSV-2 DNA. A 230 bp region of the pol gene which included the LC-PCR target region was amplified from HSV-1 and 2 in separate reactions using primers HSV pol F1 (5'AGATGGCGAGCCACATCTC 3') and HSV pol R1 (5'GGATACGGTATCGTCGTAAAAC 3'). The amplification mixture contained the following: 10× AmpliTaq Gold PCR buffer containing 150 mM Tris-HCl and 500 mM KCl, pH of 8.3 (PE Applied Biosystems), 200 μM of each dNTP, 1.5 mM MgCl2, 1 μM each primer and 1 U AmpliTaq Gold. The PCR amplification consisted of one cycle of 95°C/5 min, followed by 30 cycles of 95°C/10 s, 55°C/15 s and 72°C/30 s. This was followed by an extension cycle at 72°C/5 min and incubation at 4°C. The PCR product was purifed from an agarose gel using the QIAquick Gel Extraction Kit (QIAGEN) according to the manufacturer's protocol. The amplicon was cloned directly into pGEM®-T easy vector using the pGEM®-T Easy Vector System according to the manufacturer's protocol (Promega). The identity of individual clones was confirmed by sequencing both strands of the viral DNA insert. Plasmid DNA preparations were then made using QIAprep Spin Miniprep Kits (QIAGEN) according to the manufacturer's instructions. The plasmids were digested with Pst I (Promega) (which cuts at one site only in the recombinant plasmid) and the linear form was purified from an agarose gel as described earlier. HSV DNA within a region (different from that amplified in the LC-PCR) of the polymerase gene was amplified with the following primer pair pol [L]5'-ATCAACTTCGACTGGCCCTTC-3' and pol [R]5'-CCGTACATGTCGATGTTCACC-3' . The amplified product was hybridized with a biotin-labelled probe, bPolprb5'-CGCGTGTGGGACATXGGCCAGAGCCACTT-3'. The 'X' nucleotide in this probe was substitued with inosine due to a single base difference between HSV-1 and HSV-2 at that position (GenBank accession numbers M12356 and M16321 respectively). In the dNTP mix, 50 μM dTTP was replaced with digoxygenin-labelled dUTP:dTTP in the ratio of 1:19. The PCR amplification cycle consisted of an initial denaturation at 95°C/10 min followed by 5 cycles of 95°C/45 s, 64°C/45 s, 72°C/1 min; 15 cycles of 95°C/45 s, 64°C/45 s, 72°C/1 min 30 s; 5 cycles of 95°C/45 s, 64°C/45 s, 72°C/2 min; 10 cycles of 95°C/45 s, 64°C/45 s, 72°C/2 min 30 s followed by incubation at 4°C. The amplified DNA was detected in a DIG-ELISA kit according to the manufacturer's instructions (Roche Molecular Diagnostics). In the DIG-ELISA, biotin-labelled probe was bound to streptavidin-coated microwells. The probe was then hybridised to the denatured (with 0.4 M NaOH) single strand DNA. The latter hybrid was detected with peroxidase-labelled specific antibody to digoxygenin. The enzyme reaction was then detected using ABTS as chromogen. In our laboratory, detection of amplified DNA with the DIG-ELISA showed a 10–100 fold increase in sensitivity compared to gel electrophoresis (unpublished data but see also ). 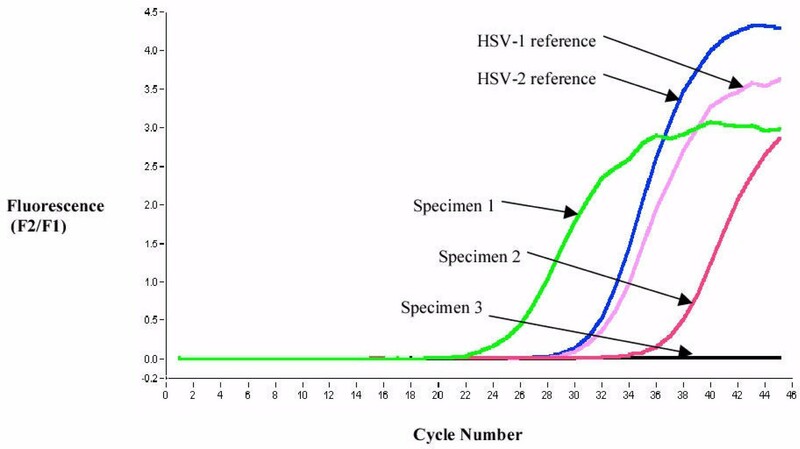 The limit of detection of HSV-1 plasmid DNA (gift of Dr S. Efstatiou, Cambridge University, England) with PCR-ELISA was 120 copies/reaction (equivalent to 24 copies/μl) (unpublished data). DNA sequencing reactions were performed using the BigDye™ terminator system (PE Applied Biosystems) and the results determined using an ABI PRISM® 3700 DNA Analyser (PE Applied Biosystems) according to the manufacturer's instructions. Sequence data were compared to HSV-1 and 2 sequences obtained from GenBank (accession numbers M12356 and M16321 respectively), using a multiple alignment progam from the Australian National Genomic Information Service http://www.angis.org.au. In order to confirm the absence of cross contamination between samples during DNA extractions, 24 genital and cutaneous samples, previously shown to be negative for HSV by culture and LC PCR, were combined and the volume made up to 24 ml with viral transport medium. Twenty-four 1 ml-aliquots were then prepared. Two of these samples were spiked with HSV-1 and three with HSV-2 under code. DNA was then extracted from these 24 samples in four batches of six samples to simulate routine diagnostic conditions. We would like to thank colleagues in the Virus Laboratory for their assistance, Nicole Pratt for statistical analysis, Brendan Cullinane for his initial contribution to this work and the generous support of Roche Diagnostics (Australia) for the LightCycler. JB and BB carried out the PCR, EIA and culture tests. JB, AN and EW designed the primers and hybridization probes in the LC-PCR test. JB and TK did the cloning experiments. TK, JB and GH prepared the manuscript. TK conceived of the study, participated in its design and coordination. All authors read and approved the final manuscript.